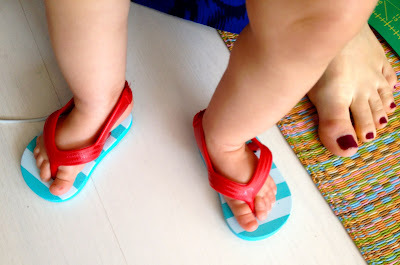 These flip flops are the latest addition to Elsa's shoe collection and were $2.25 at Old Navy. I couldn't resist them, even though Elsa isn't walking yet and has no use for flip flops, even if she does live in a beach city. Baby shoes look so miniature until you put them on a baby's feet, and realize the shoes are still too big.